The grinder pumps are provided with a cutting system able to chop up paper, little ropes, towels, napkins, leather, objects in plastic, rubber, lattex or other fibrous parts present into the sewage water. The grinding pumps are required when the delivery pipes are so narrow that a solid part could clog the pipe itself or when it is needed a pump for sewage water but with an high head. The pumps series GRINDER 500 must always be connected to a control box including a manual reset amperometric protection: this kind of protection is necessary to avoid that the motor can get burnt in case a too hard solid part blocks the cutting system. The GRINDER 500 is very professional and it is usually installed in hospitals, camping, restaurants and hotels. 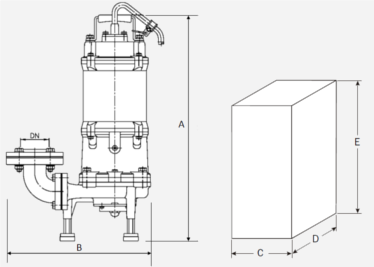 This model cannot be used to pump water containing stones nor hard solid parts (e.g. pieces of wood or metal) nor straw. Mechanical seal Double mechanical seal in oil chamber. The lower one in silicum carbide / silicum carbide / NBR, the upper one in allumina / graphite / NBR + NBR oil seal. Motor protection Automatic reset built-it thermal protection. Anyway the pump must be connected to a fused remote isolator switch at customer's care (see optional electric board). 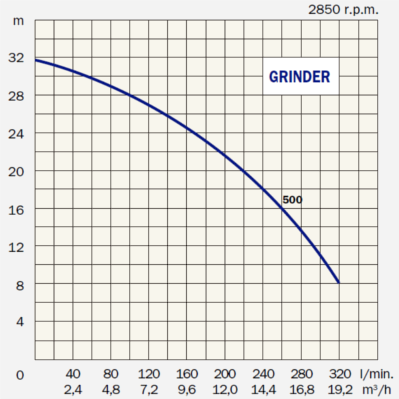 Electric board The model GRINDER 500 must necessarly be connected to an electric board with an amperometric protection (as the model F6-0.5/10-3). This kind of protection is necessary for grinder pumps to avoid that the motor can get burnt in case a too hard solid part blocks the cutting system.